Camping is hands down, one of the best ways to unwind from the daily routine and stresses brought about by today’s lifestyle. But, planning a camping trip isn't the easiest thing to do, especially when you think of where you’ll be sleeping. If you’ll be spending the night in a tent, then you won’t have the luxury of sleeping on a bed. Often, the alternative that campers have is a sleeping pad. Although comfortable and light enough to carry around, a sleeping pad doesn't have insulating properties, making it an unsuitable choice when camping in a cold climate. A better alternative is a camping air mattress. With the best air mattress for camping, you will sleep soundly just like you would if you were home. The only difference is that you’ll wake up to the beautiful sounds of nature. Read on to learn more about top-rated air mattresses. 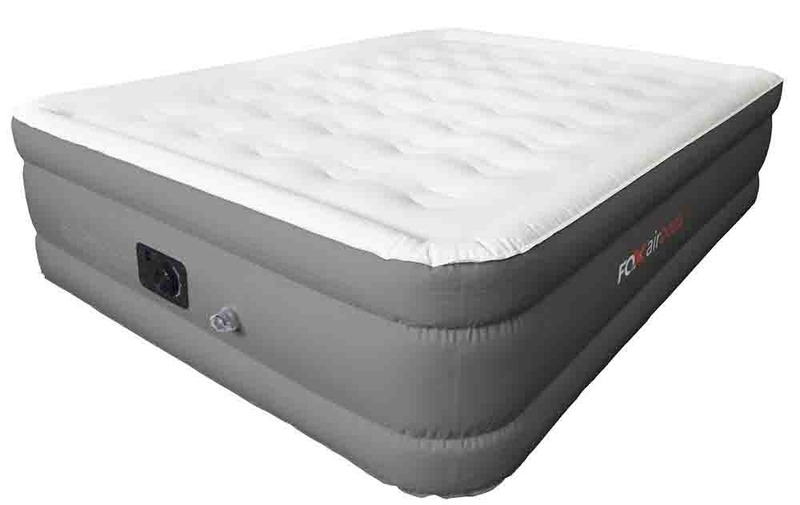 Inflated Dimensions: 80" x 60" x 20"
The best air mattress on the market is the SoundAsleep Dream Series Air Mattress, which is closely followed by Intex Comfort Plush Dura-Beam Airbed and King Koil Luxury Raised Air Mattress. There are several reasons why these are our top picks. For one, these air mattresses are versatile. Not only are they good for camping but they can also be used at home when you receive unexpected guests. These air mattresses are also pretty robust and durable. Plus, they are adjustable, enabling you to choose the level of firmness that feels comfortable. One of the factors you’ll want to emphasize on is the amount of support that the air mattress provides. 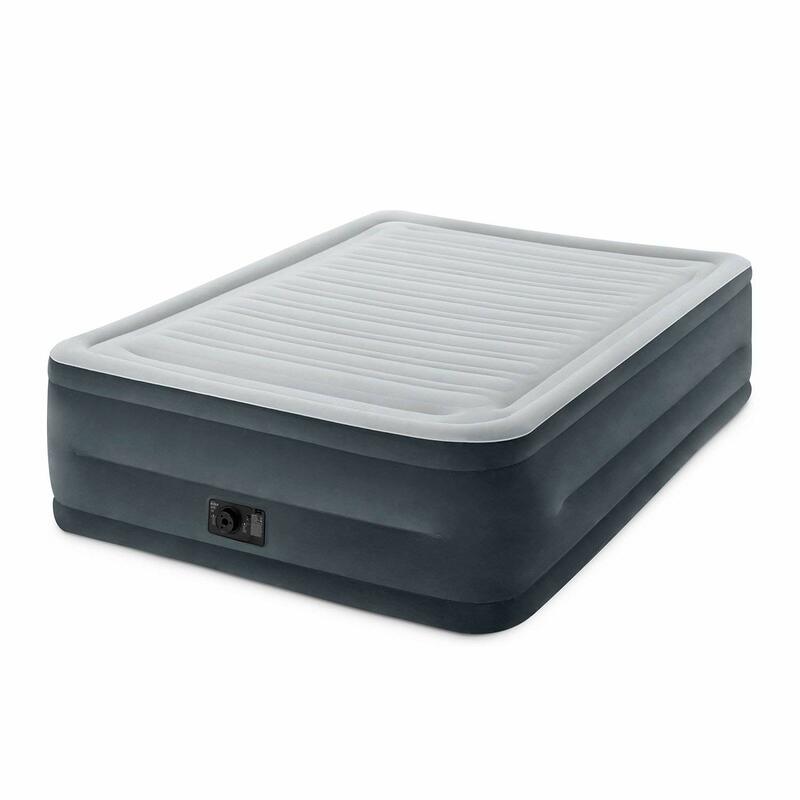 A good air mattress is one that provides optimal support by distributing your weight uniformly. 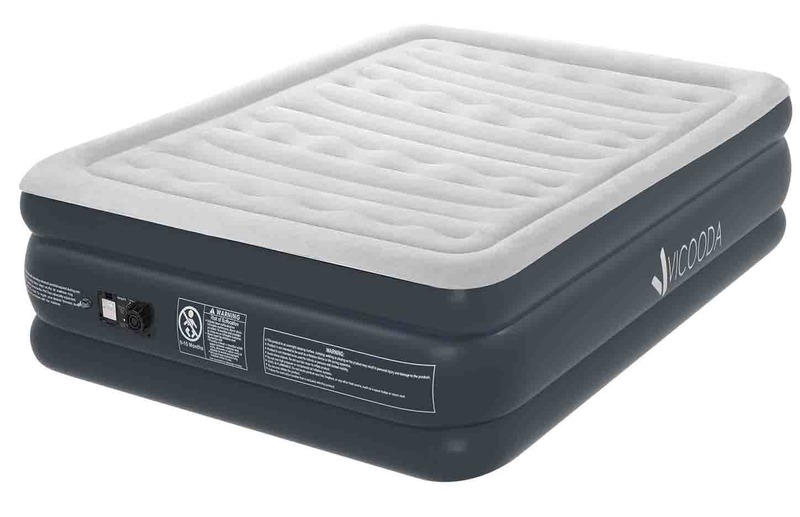 To determine this aspect, check whether the air mattress has a net of air coils as these are the components responsible for weight distribution. If you intend to buy a single sized air mattress, then a pump might not be necessary. But if you’re buying a bigger model, then a pump is a must-have. There are two types of pumps to choose from namely: manual and electric. A manual air pump requires you to blow with your mouth, and this can take up to half an hour to fully inflate the mattress. To avoid this task, a better option is an electric or built-in pump, which inflates the mattress in five minutes or less. The weight of the air mattress is another aspect worth looking into. It’s not obvious that you’ll find a suitable camping site where you can drive to. At times, you have to park your vehicle in a different location from you set up camp. This means that you’ll have to carry your camping gear to the site. Consequently, an air mattress should be light enough so that it’s easy to carry in your backpack without causing you too much fatigue. It also shouldn’t be too bulky that it takes up most of the space in your trunk. 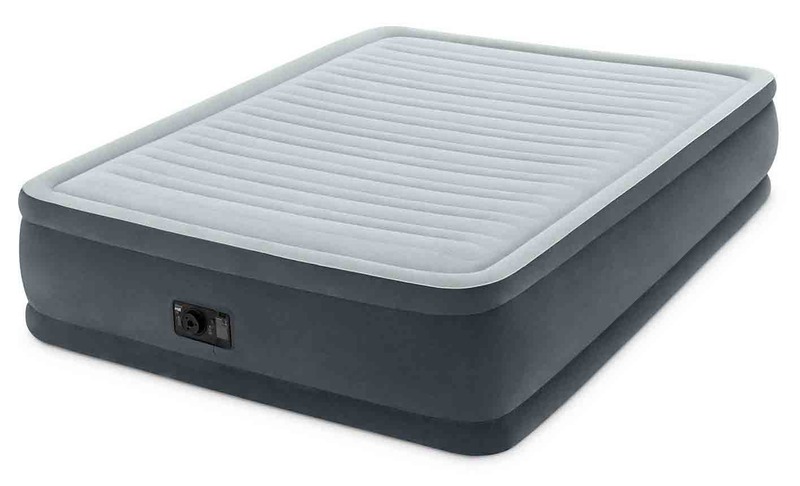 If you’re looking for a camping air mattress that will stand the test of time, then look no further than the SoundAsleep Dream Series. Consisting of extra thick and reinforced fabric, the SoundAsleep air mattress was uniquely designed to withstand rough terrain and extreme weather. It’s made of eco-friendly PVC, which is also characterized by having an anti-slip bottom to prevent unnecessary sliding. But perhaps the key highlight of this mattress entails its patented one-click internal pump, which guarantees a quick inflation and deflation. Designed for camping and home use, this air mattress reaches full inflation in less than four minutes. Big enough to accommodate two people. It has an ultra-thick waterproof top layer. The PVC construction makes the mattress very durable. Boasts SureGrip technology to avoid unwanted sliding. Pricier than other air mattresses for camping. 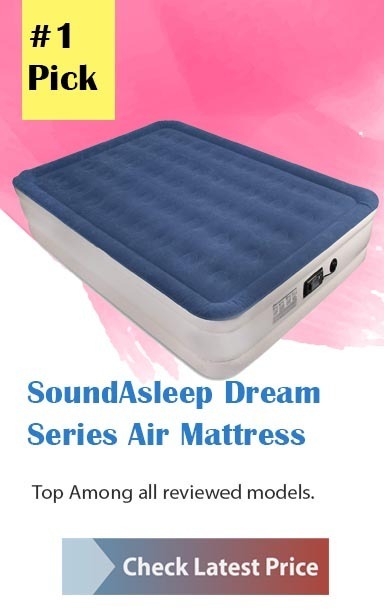 Summary :- The SoundAsleep Dream Series is one of the most advanced air mattresses. It’s packed with essential features that are sure to provide the best sleeping experience. Intex, the brains behind this air mattress, seems to have taken comfort to a whole new level. With their latest offering- the Comfort Plush Dura-Beam- there is no limit to how much comfort you get. The Intex Dura-Beam is a queen size air mattress, although it’s also available in a twin size. The most distinct feature of this mattress is its fiber-tech construction. What this means is that it’s made of hundreds of polyester fibers, which provide additional comfort, sturdiness and durability. When fully inflated, this air mattress is 22 inches from the ground. Overall, its dimensions are 60” by 22” by 80” and it weighs about 21 pounds. Equipped with an electric pump, the mattress takes no more than 4 minutes to inflate. Also important to note is that it has indented sides, which prevent your sheets from slipping. Comes with a convertible bag. Summary :- The Intex Dura-Beam is a versatile and comfortable air mattress. Its fiber construction not only makes it unique but also very durable. This is another top-of-the-line air mattress that is sure to benefit even the fussiest sleepers. But most importantly, it’s made by King Koil, one of the few manufacturers that is backed by the International Chiropractors Association. 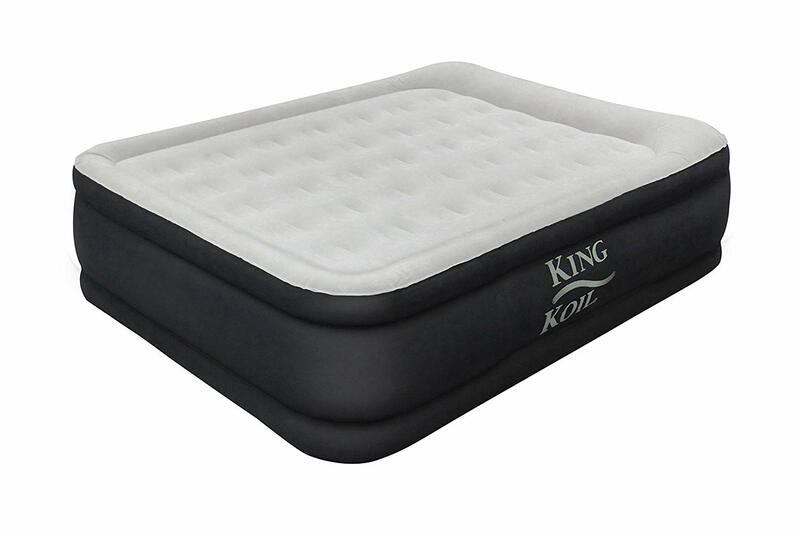 The King Koil is more than just comfortable. It has a classy design that makes it ideal for camping trips and for home applications as well. Since it’s a raised mattress, all you have to do is to add a frame and skirt around it to give it a complete bed-like look. Another thing you’ll love about this air mattress is the waterproof quilt top that provides optimal comfort. This layer helps in soothing in your back and in cushioning the texture of the air coils. Plus, it comes with a built-in 120V AC pump, which inflates the mattress in under four minutes. Has a maximum weight limit of 600 lbs. Not the best choice for rugged camping. Summary :- If you’ve been searching for a luxurious stay at your camping site, then the King Koil air mattress is your best option. Offering three different size options, this mattress provides an unparalleled sleeping space. Featuring a decent pricing and lower height profile, the Insta-Bed air mattress is comfortable, long-lasting and easy to use. The Insta-Bed is not as popular as our top picks. But it’s only drawback is that it has a low height. To be specific, this mattress stands about one foot off the ground when in full inflation, and this could make sleeping uncomfortable. Height aside, this air mattress has all the features of a quality and inflatable air mattress. It’s fitted with the Insta III AC pump, which is at least 20% quieter than most air mattress pumps. Also, this pump inflates and deflates pretty fast. The top layer of this mattress is constructed from PVC material, meaning that it’s water-resistant, damage-resistant and ultra-durable. The build of this air mattress constitutes 35 circular air coils, and this is just slightly lower than our top pick’s 40 count. Has a quiet and effective pump. Fitted with a separate compartment for the charger. Is of a compact size that fits nicely in the carry bag. It’s not possible to tuck in sheets. Summary :- If you’re interested in a quick-inflating air mattress, you are better off going for the Insta-Bed Raised, which inflates in just 4 minutes or less. It’s more affordable, yet it doesn’t compromise on comfort and longevity. As its name suggests, this air mattress allows you to sleep like royalty. It’s the best fit for campers who wouldn’t want to compromise one comfort and luxury. There are a couple of features you will like about Noble Comfort. The first is the built-in pump, which allows you to inflate and deflate the mattress in a very short time. The second is the coil beam technology. This mattress has a ton of air beams, which give it the firmness characteristic. This way, you don’t have to worry about sinking once you sleep. We also like that the mattress is made of puncture-resistant PVC material. 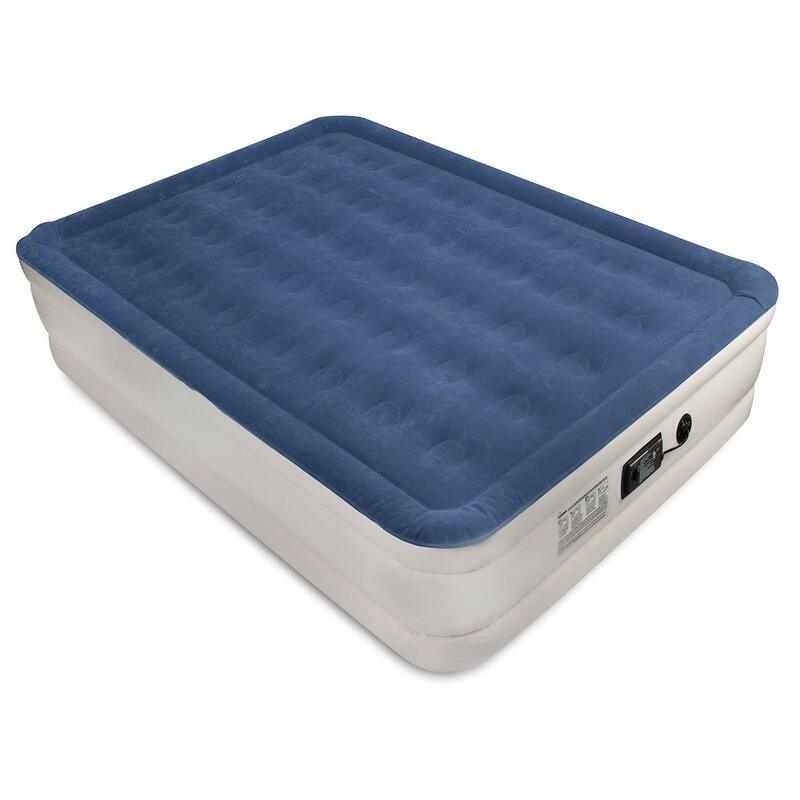 This means that the Noble Comfort is an air bed designed to last you a lifetime. 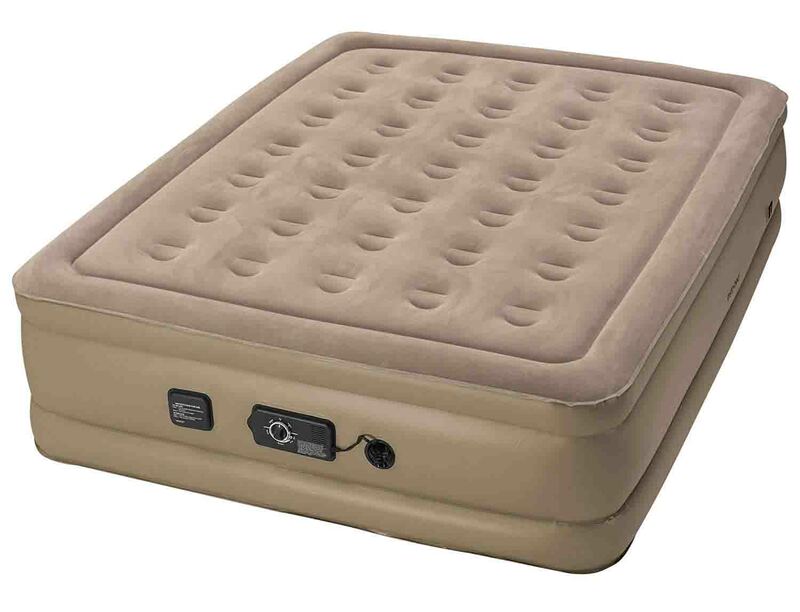 For maximum comfort, the air mattress has an ultra-suede, soft flocking top. Offers versatility: it can be used with or without sheets. It’s available in queen and twin XL sizes. Has an elevated design that makes it easy to get off or on. Has an odor when it’s removed from its packaging. 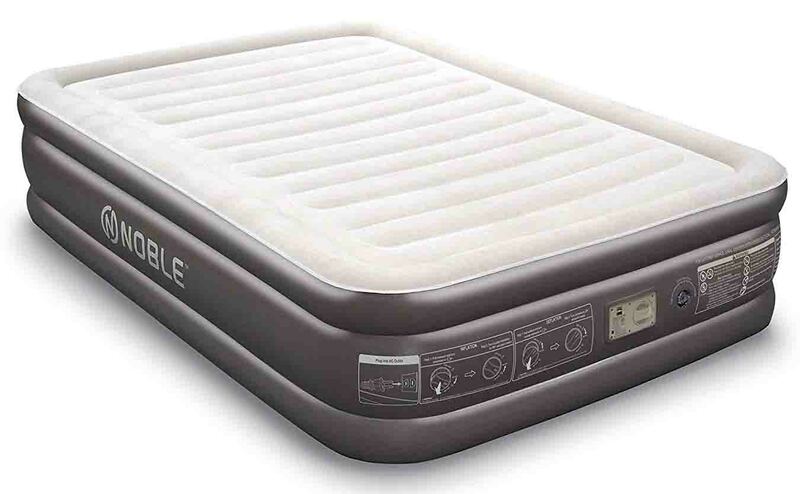 Summary :- Unless you want to wake up with a sore back, you should consider investing in a quality camping air mattress like the Noble Comfort. If you are a frequent camper, one of the things you’ll want to check before purchasing an air mattress is the ease of carrying it. The Yeacar air mattress is among the lightest on the market. Weighing just slightly over 22 pounds, the Yeacar dgfdgdg is a portable air mattress. So if you have to carry it around and set up camp on a different location, you don’t have to worry about the mattress weighing you down. Ironically, this mattress can support a whopping 650 lbs. without compromising on its integrity. In addition to its lightweight design, this air mattress also boasts a multi-layer soft top. This provides campers with an incredibly cozy sleeping experience. It’s also easy to use. With just one click toggle, you can inflate or deflate the mattress in less than 4 minutes. When fully inflated, this air mattress stands at 18 inches from the ground, making it easily accessible by both the young and old. It’s a double high air mattress providing ready access. A carrying bag is included in package for easy storage. The PVC construction helps to prevent sliding. Summary :- For campers looking for lightweight and portable air mattresses, the Yeacar dgfdgdg which weighs only 22.4 lbs. makes a strong contender. If you’ve been searching for a truly comfortable camping air mattress that has a mid-range price tag, then the Fox Airbed is your best bet. A key highlight of this air mattress is its sturdy design. Although a little heavier than most air mattresses, the Fox Airbed is one that will serve you for a long time. It also has an ultra-flat surface, which is uniquely designed to provide back support. As for convenience, most buyers report that inflating this air mattress is a smooth and quick process. 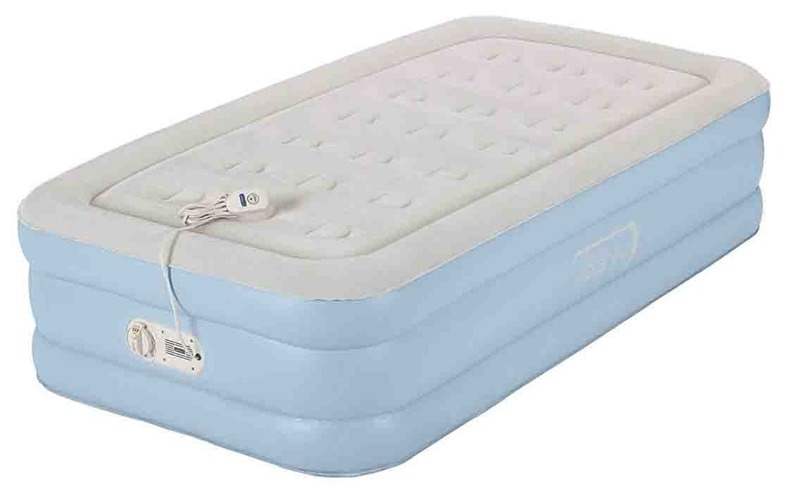 It comes with an inbuilt, two-way external pump, which inflates the mattress in just four and a half minutes. Fitted with air flow chambers. Boasts a heavy duty construction. Summary :-The design of the Fox Airbed is one of a kind. It’s constructed with high-quality materials, making it a durable and reliable air mattress for camping. Plus, it’s cheaper than most high-end airbeds. Lazery Sleep is the best self-inflating air mattress on the market. For a camper who doesn’t want to struggle with carrying and using a pump for inflating the camping air mattress, you might want to consider a self-inflating model like Lazery Sleep. 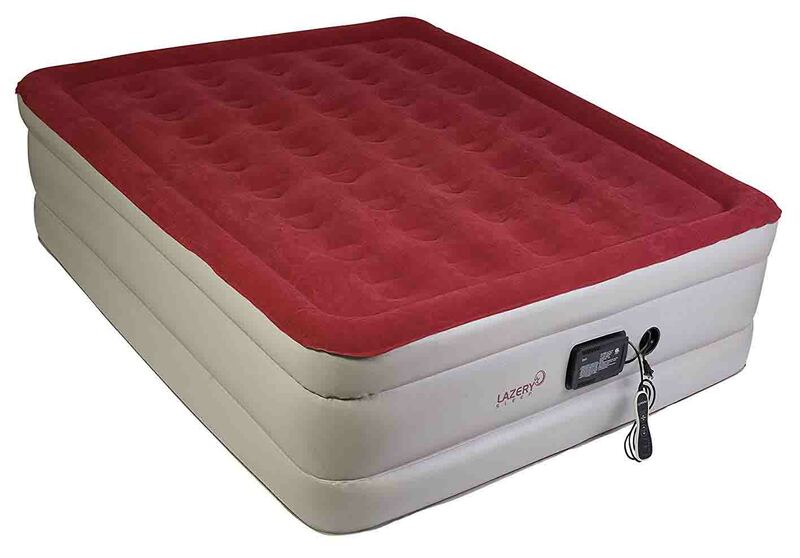 This mattress is available in a queen size and it comes fitted with an air pump. It also comes with a carry bag that makes it convenient to carry. The electric pump inflates the mattress in under four minutes. This is handy when you don’t want to set it up until later in the evening. This pump also saves a significant amount of time, energy and effort, which you’d employ if you were using a manual pump. A key highlight of Lazery Sleep is the inclusion of a LED remote control for inflating the mattress. Unlike with other air mattresses, you won’t have to bend down so as to flip a switch. The remote is attached to the air mattress using a cord that is a couple of feet long. What’s more, this air bed offers you seven settings for firmness, all of which you can control using the remote. You can choose between soft plush and extra firm, depending on your preference. The air mattress is thick, and this prevents it from being bulky once you deflate it. Equipped with a LED remote, allowing you to configure settings without moving a muscle. Made of durable and puncture-free materials. Has a tendency to lose air. Seams can get ripped easily. Summary :-Lazery Sleep is a good air mattress for the money. Sure, you can find much cheaper air beds, but this one provides comfort and stability. If you usually go camping with your kids, the AeroBed One-Touch will serve your toddlers well. It’s packed with several features that make it a superb choice for kids. The first aspect that makes AeroBed a suitable air mattress for kids is the size. Measuring 74” by 39” by 14”, this air bed is neither too big nor too small for children. In fact, it’s a twin size, which is a step up from the crib mattress. Another factor that makes this air mattress great for kids is its anti-microbial treated sleeping surface. Essentially, this means that it’s able to resist smells, mold, mildew and fungus, so you don’t have to worry that your child will get any infections. 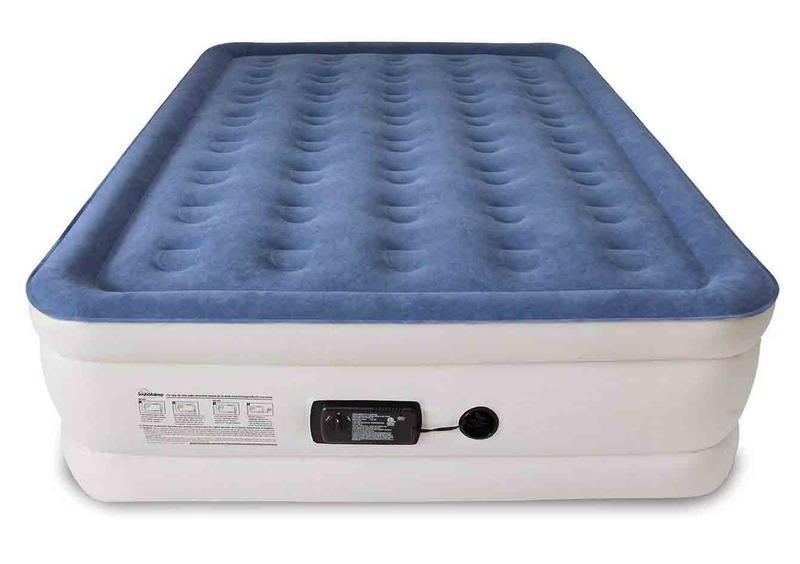 This air mattress also provides a unique One-Touch Comfort pump, which allows you to inflate it without having to bend down. Designed with a compact size that fits nicely in the carry bag. A great air mattress for toddlers. Easy to use thanks to the One-Touch working mechanism. The whoosh valve allows for an effortless inflation and deflation. Summary :-Camping with kids will be a lot easier if you invest in the AeroBed air mattress. 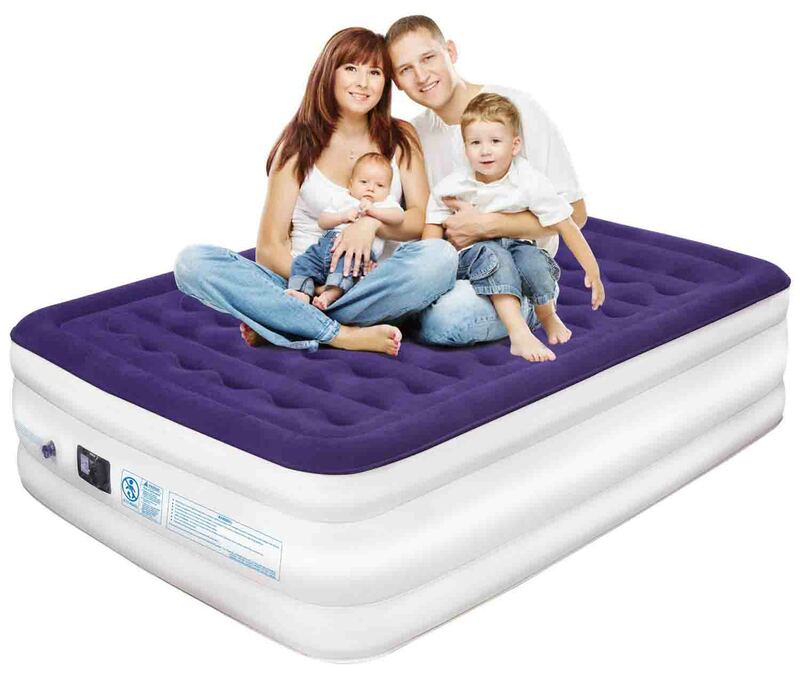 With this air bed, you’re guaranteed that your children will sleep soundly all night long. The VICOODA may not be a high-end luxury air mattress, but it’s also a good option for several reasons. For one, this air mattress boasts superior craftsmanship. It’s constructed using eco-friendly PVC material, making it waterproof, dust-proof, puncture-resistant and more. Another plus of this air bed is the non-skid base that keeps your bedding from slipping at night. We also like that the Vicooda has a durable construction. It’s uniquely designed with a double layer that enables it to accommodate up to 650 pounds. And thanks to its exceptional wave veins, this air bed supports the contour of your spine while also helping you relax. Boasts superior welding that makes it anti-slip and air-tight. Covered in plush flocking to guarantee comfort. Consists of horizontal air chambers to provide additional stability.Consists of horizontal air chambers to provide additional stability. Has a maximum weight limit of 650 pounds. Has a rib-like structure which allows sheets to fit perfectly. Reaches full inflation in just three minutes. Summary :- If you’re looking for a budget-friendly air mattress, there is no better choice than VICOODA. Even though it’s not our top pick, it has an array of features that warrant it a place in our top-ten list. To find the best air mattress, we look for the most sought-after air mattresses on major retailers like Amazon. We also searched for those air beds that repeatedly feature on “best of” lists. From this search, we were able to identify 20 top-rated air mattresses. The next thing we did was to look for those features that buyers are most interested in when they’re purchasing an air mattress. We noticed that a majority of campers focus on the ease of inflation, minimal air loss, and comfort. We tested the products based on these aspects, and this helped us narrow down our options to the 10 best air mattresses. A quality camping air mattress could mean all the difference in the world. Thanks to this air bed, you can wake up peacefully to the sounds of nature rather than waking up fatigued. Air mattress technology has come a long way. We now have models that feel as comfortable as your own bed, making your camping experience feel like a home away from home. But there are a few features you should pay attention to when getting an air mattress. These include aspects such as type of pump, inflation period and build.